by Chris Woodford. Last updated: December 2, 2018. Computers truly came into their own as great inventions in the last two decades of the 20th century. But their history stretches back more than 2500 years to the abacus: a simple calculator made from beads and wires, which is still used in some parts of the world today. The difference between an ancient abacus and a modern computer seems vast, but the principle—making repeated calculations more quickly than the human brain—is exactly the same. 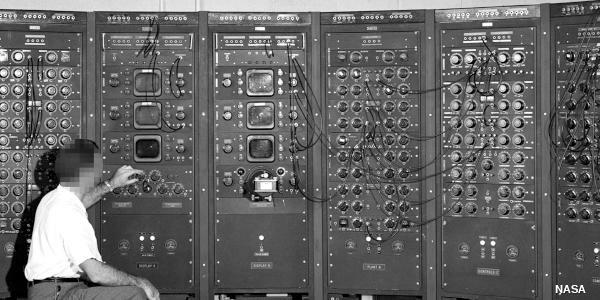 Read on to learn more about the history of computers—or take a look at our article on how computers work. 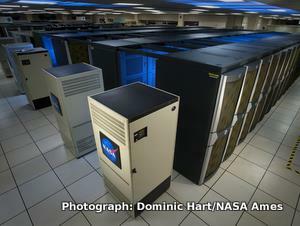 Photo: One of the world's most powerful computers: NASA's Pleiades ICE supercomputer consists of 112,896 processor cores made from 185 racks of Silicon Graphics (SGI) workstations. Photo by Dominic Hart courtesy of NASA Ames Research Center. It is a measure of the brilliance of the abacus, invented in the Middle East circa 500 BC, that it remained the fastest form of calculator until the middle of the 17th century. Then, in 1642, aged only 18, French scientist and philosopher Blaise Pascal (1623–1666) invented the first practical mechanical calculator, the Pascaline, to help his tax-collector father do his sums. The machine had a series of interlocking cogs (gear wheels with teeth around their outer edges) that could add and subtract decimal numbers. Several decades later, in 1671, German mathematician and philosopher Gottfried Wilhelm Leibniz (1646–1716) came up with a similar but more advanced machine. Instead of using cogs, it had a "stepped drum" (a cylinder with teeth of increasing length around its edge), an innovation that survived in mechanical calculators for 300 hundred years. The Leibniz machine could do much more than Pascal's: as well as adding and subtracting, it could multiply, divide, and work out square roots. Another pioneering feature was the first memory store or "register." 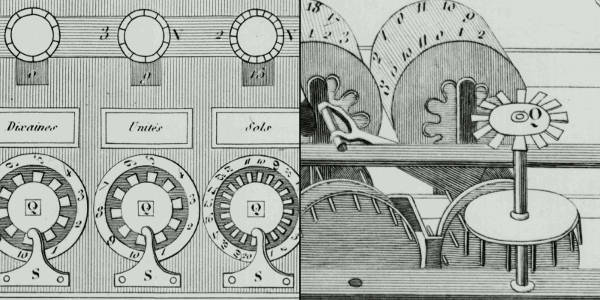 Artwork: Pascaline: Two details of Blaise Pascal's 17th-century calculator. Left: The "user interface": the part where you dial in numbers you want to calculate. Right: The internal gear mechanism. Picture courtesy of US Library of Congress. Apart from developing one of the world's earliest mechanical calculators, Leibniz is remembered for another important contribution to computing: he was the man who invented binary code, a way of representing any decimal number using only the two digits zero and one. Although Leibniz made no use of binary in his own calculator, it set others thinking. In 1854, a little over a century after Leibniz had died, Englishman George Boole (1815–1864) used the idea to invent a new branch of mathematics called Boolean algebra. In modern computers, binary code and Boolean algebra allow computers to make simple decisions by comparing long strings of zeros and ones. But, in the 19th century, these ideas were still far ahead of their time. It would take another 50–100 years for mathematicians and computer scientists to figure out how to use them (find out more in our articles about calculators and logic gates). Neither the abacus, nor the mechanical calculators constructed by Pascal and Leibniz really qualified as computers. A calculator is a device that makes it quicker and easier for people to do sums—but it needs a human operator. A computer, on the other hand, is a machine that can operate automatically, without any human help, by following a series of stored instructions called a program (a kind of mathematical recipe). Calculators evolved into computers when people devised ways of making entirely automatic, programmable calculators. Photo: Punched cards: Herman Hollerith perfected the way of using punched cards and paper tape to store information and feed it into a machine. Here's a drawing from his 1889 patent Art of Compiling Statistics (US Patent#395,782), showing how a strip of paper (yellow) is punched with different patterns of holes (orange) that correspond to statistics gathered about people in the US census. Picture courtesy of US Patent and Trademark Office. The first person to attempt this was a rather obsessive, notoriously grumpy English mathematician named Charles Babbage (1791–1871). Many regard Babbage as the "father of the computer" because his machines had an input (a way of feeding in numbers), a memory (something to store these numbers while complex calculations were taking place), a processor (the number-cruncher that carried out the calculations), and an output (a printing mechanism)—the same basic components shared by all modern computers. During his lifetime, Babbage never completed a single one of the hugely ambitious machines that he tried to build. That was no surprise. Each of his programmable "engines" was designed to use tens of thousands of precision-made gears. It was like a pocket watch scaled up to the size of a steam engine, a Pascal or Leibniz machine magnified a thousand-fold in dimensions, ambition, and complexity. For a time, the British government financed Babbage—to the tune of £17,000, then an enormous sum. But when Babbage pressed the government for more money to build an even more advanced machine, they lost patience and pulled out. Babbage was more fortunate in receiving help from Augusta Ada Byron (1815–1852), Countess of Lovelace, daughter of the poet Lord Byron. An enthusiastic mathematician, she helped to refine Babbage's ideas for making his machine programmable—and this is why she is still, sometimes, referred to as the world's first computer programmer. Little of Babbage's work survived after his death. But when, by chance, his notebooks were rediscovered in the 1930s, computer scientists finally appreciated the brilliance of his ideas. Unfortunately, by then, most of these ideas had already been reinvented by others. Babbage had intended that his machine would take the drudgery out of repetitive calculations. Originally, he imagined it would be used by the army to compile the tables that helped their gunners to fire cannons more accurately. Toward the end of the 19th century, other inventors were more successful in their effort to construct "engines" of calculation. American statistician Herman Hollerith (1860–1929) built one of the world's first practical calculating machines, which he called a tabulator, to help compile census data. Then, as now, a census was taken each decade but, by the 1880s, the population of the United States had grown so much through immigration that a full-scale analysis of the data by hand was taking seven and a half years. The statisticians soon figured out that, if trends continued, they would run out of time to compile one census before the next one fell due. Fortunately, Hollerith's tabulator was an amazing success: it tallied the entire census in only six weeks and completed the full analysis in just two and a half years. Soon afterward, Hollerith realized his machine had other applications, so he set up the Tabulating Machine Company in 1896 to manufacture it commercially. A few years later, it changed its name to the Computing-Tabulating-Recording (C-T-R) company and then, in 1924, acquired its present name: International Business Machines (IBM). The history of computing remembers colorful characters like Babbage, but others who played important—if supporting—roles are less well known. At the time when C-T-R was becoming IBM, the world's most powerful calculators were being developed by US government scientist Vannevar Bush (1890–1974). In 1925, Bush made the first of a series of unwieldy contraptions with equally cumbersome names: the New Recording Product Integraph Multiplier. Later, he built a machine called the Differential Analyzer, which used gears, belts, levers, and shafts to represent numbers and carry out calculations in a very physical way, like a gigantic mechanical slide rule. Bush's ultimate calculator was an improved machine named the Rockefeller Differential Analyzer, assembled in 1935 from 320 km (200 miles) of wire and 150 electric motors. Machines like these were known as analog calculators—analog because they stored numbers in a physical form (as so many turns on a wheel or twists of a belt) rather than as digits. Although they could carry out incredibly complex calculations, it took several days of wheel cranking and belt turning before the results finally emerged. Photo: A Differential Analyzer. The black part in the background is the main part of the machine. The operator sits at a smaller console in the foreground. Picture courtesy of NASA on the Commons (where you can download a larger version of this photo). Impressive machines like the Differential Analyzer were only one of several outstanding contributions Bush made to 20th-century technology. Another came as the teacher of Claude Shannon (1916–2001), a brilliant mathematician who figured out how electrical circuits could be linked together to process binary code with Boolean algebra (a way of comparing binary numbers using logic) and thus make simple decisions. During World War II, President Franklin D. Roosevelt appointed Bush chairman first of the US National Defense Research Committee and then director of the Office of Scientific Research and Development (OSRD). In this capacity, he was in charge of the Manhattan Project, the secret $2-billion initiative that led to the creation of the atomic bomb. One of Bush's final wartime contributions was to sketch out, in 1945, an idea for a memory-storing and sharing device called Memex that would later inspire Tim Berners-Lee to invent the World Wide Web. Few outside the world of computing remember Vannevar Bush today—but what a legacy! As a father of the digital computer, an overseer of the atom bomb, and an inspiration for the Web, Bush played a pivotal role in three of the 20th-century's most far-reaching technologies. Many of the pioneers of computing were hands-on experimenters—but by no means all of them. One of the key figures in the history of 20th-century computing, Alan Turing (1912–1954) was a brilliant Cambridge mathematician whose major contributions were to the theory of how computers processed information. In 1936, at the age of just 23, Turing wrote a groundbreaking mathematical paper called "On computable numbers, with an application to the Entscheidungsproblem," in which he described a theoretical computer now known as a Turing machine (a simple information processor that works through a series of instructions, reading data, writing results, and then moving on to the next instruction). Turing's ideas were hugely influential in the years that followed and many people regard him as the father of modern computing—the 20th-century's equivalent of Babbage. Although essentially a theoretician, Turing did get involved with real, practical machinery, unlike many mathematicians of his time. During World War II, he played a pivotal role in the development of code-breaking machinery that, itself, played a key part in Britain's wartime victory; later, he played a lesser role in the creation of several large-scale experimental computers including ACE (Automatic Computing Engine), Colossus, and the Manchester/Ferranti Mark I (described below). Today, Alan Turing is best known for conceiving what's become known as the Turing test, a simple way to find out whether a computer can be considered intelligent by seeing whether it can sustain a plausible conversation with a real human being. The World War II years were a crucial period in the history of computing, when powerful gargantuan computers began to appear. Just before the outbreak of the war, in 1938, German engineer Konrad Zuse (1910–1995) constructed his Z1, the world's first programmable binary computer, in his parents' living room. The following year, American physicist John Atanasoff (1903–1995) and his assistant, electrical engineer Clifford Berry (1918–1963), built a more elaborate binary machine that they named the Atanasoff Berry Computer (ABC). It was a great advance—1000 times more accurate than Bush's Differential Analyzer. These were the first machines that used electrical switches to store numbers: when a switch was "off", it stored the number zero; flipped over to its other, "on", position, it stored the number one. Hundreds or thousands of switches could thus store a great many binary digits (although binary is much less efficient in this respect than decimal, since it takes up to eight binary digits to store a three-digit decimal number). These machines were digital computers: unlike analog machines, which stored numbers using the positions of wheels and rods, they stored numbers as digits. The first large-scale digital computer of this kind appeared in 1944 at Harvard University, built by mathematician Howard Aiken (1900–1973). Sponsored by IBM, it was variously known as the Harvard Mark I or the IBM Automatic Sequence Controlled Calculator (ASCC). A giant of a machine, stretching 15m (50ft) in length, it was like a huge mechanical calculator built into a wall. It must have sounded impressive, because it stored and processed numbers using "clickety-clack" electromagnetic relays (electrically operated magnets that automatically switched lines in telephone exchanges)—no fewer than 3304 of them. Impressive they may have been, but relays suffered from several problems: they were large (that's why the Harvard Mark I had to be so big); they needed quite hefty pulses of power to make them switch; and they were slow (it took time for a relay to flip from "off" to "on" or from 0 to 1). Photo: An analog computer being used in military research in 1949. Picture courtesy of NASA on the Commons (where you can download a larger version. Most of the machines developed around this time were intended for military purposes. Like Babbage's never-built mechanical engines, they were designed to calculate artillery firing tables and chew through the other complex chores that were then the lot of military mathematicians. During World War II, the military co-opted thousands of the best scientific minds: recognizing that science would win the war, Vannevar Bush's Office of Scientific Research and Development employed 10,000 scientists from the United States alone. Things were very different in Germany. When Konrad Zuse offered to build his Z2 computer to help the army, they couldn't see the need—and turned him down. On the Allied side, great minds began to make great breakthroughs. In 1943, a team of mathematicians based at Bletchley Park near London, England (including Alan Turing) built a computer called Colossus to help them crack secret German codes. Colossus was the first fully electronic computer. Instead of relays, it used a better form of switch known as a vacuum tube (also known, especially in Britain, as a valve). The vacuum tube, each one about as big as a person's thumb and glowing red hot like a tiny electric light bulb, had been invented in 1906 by Lee de Forest (1873–1961), who named it the Audion. This breakthrough earned de Forest his nickname as "the father of radio" because their first major use was in radio receivers, where they amplified weak incoming signals so people could hear them more clearly. In computers such as the ABC and Colossus, vacuum tubes found an alternative use as faster and more compact switches. Just like the codes it was trying to crack, Colossus was top-secret and its existence wasn't confirmed until after the war ended. As far as most people were concerned, vacuum tubes were pioneered by a more visible computer that appeared in 1946: the Electronic Numerical Integrator And Calculator (ENIAC). The ENIAC's inventors, two scientists from the University of Pennsylvania, John Mauchly (1907–1980) and J. Presper Eckert (1919–1995), were originally inspired by Bush's Differential Analyzer; years later Eckert recalled that ENIAC was the "descendant of Dr Bush's machine." But the machine they constructed was far more ambitious. It contained nearly 18,000 vacuum tubes (nine times more than Colossus), was around 24 m (80 ft) long, and weighed almost 30 tons. ENIAC is generally recognized as the world's first fully electronic, general-purpose, digital computer. Colossus might have qualified for this title too, but it was designed purely for one job (code-breaking); since it couldn't store a program, it couldn't easily be reprogrammed to do other things. ENIAC was just the beginning. Its two inventors formed the Eckert Mauchly Computer Corporation in the late 1940s. Working with a brilliant Hungarian mathematician, John von Neumann (1903–1957), who was based at Princeton University, they then designed a better machine called EDVAC (Electronic Discrete Variable Automatic Computer). In a key piece of work, von Neumann helped to define how the machine stored and processed its programs, laying the foundations for how all modern computers operate. After EDVAC, Eckert and Mauchly developed UNIVAC 1 (UNIVersal Automatic Computer) in 1951. They were helped in this task by a young, largely unknown American mathematician and Naval reserve named Grace Murray Hopper (1906–1992), who had originally been employed by Howard Aiken on the Harvard Mark I. 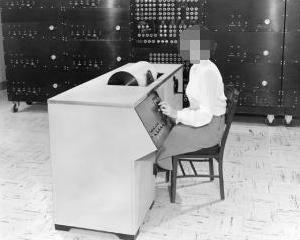 Like Herman Hollerith's tabulator over 50 years before, UNIVAC 1 was used for processing data from the US census. It was then manufactured for other users—and became the world's first large-scale commercial computer. Vacuum tubes were a considerable advance on relay switches, but machines like the ENIAC were notoriously unreliable. The modern term for a problem that holds up a computer program is a "bug." Popular legend has it that this word entered the vocabulary of computer programmers sometime in the 1950s when moths, attracted by the glowing lights of vacuum tubes, flew inside machines like the ENIAC, caused a short circuit, and brought work to a juddering halt. But there were other problems with vacuum tubes too. They consumed enormous amounts of power: the ENIAC used about 2000 times as much electricity as a modern laptop. And they took up huge amounts of space. Military needs were driving the development of machines like the ENIAC, but the sheer size of vacuum tubes had now become a real problem. ABC had used 300 vacuum tubes, Colossus had 2000, and the ENIAC had 18,000. The ENIAC's designers had boasted that its calculating speed was "at least 500 times as great as that of any other existing computing machine." But developing computers that were an order of magnitude more powerful still would have needed hundreds of thousands or even millions of vacuum tubes—which would have been far too costly, unwieldy, and unreliable. So a new technology was urgently required. 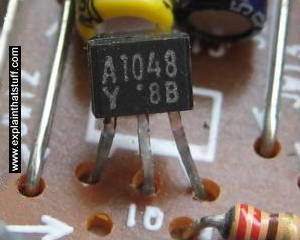 Photo: A typical transistor on an electronic circuit board. The solution appeared in 1947 thanks to three physicists working at Bell Telephone Laboratories (Bell Labs). John Bardeen (1908–1991), Walter Brattain (1902–1987), and William Shockley (1910–1989) were then helping Bell to develop new technology for the American public telephone system, so the electrical signals that carried phone calls could be amplified more easily and carried further. Shockley, who was leading the team, believed he could use semiconductors (materials such as germanium and silicon that allow electricity to flow through them only when they've been treated in special ways) to make a better form of amplifier than the vacuum tube. When his early experiments failed, he set Bardeen and Brattain to work on the task for him. Eventually, in December 1947, they created a new form of amplifier that became known as the point-contact transistor. Bell Labs credited Bardeen and Brattain with the transistor and awarded them a patent. This enraged Shockley and prompted him to invent an even better design, the junction transistor, which has formed the basis of most transistors ever since. Like vacuum tubes, transistors could be used as amplifiers or as switches. But they had several major advantages. They were a fraction the size of vacuum tubes (typically about as big as a pea), used no power at all unless they were in operation, and were virtually 100 percent reliable. The transistor was one of the most important breakthroughs in the history of computing and it earned its inventors the world's greatest science prize, the 1956 Nobel Prize in Physics. By that time, however, the three men had already gone their separate ways. John Bardeen had begun pioneering research into superconductivity, which would earn him a second Nobel Prize in 1972. Walter Brattain moved to another part of Bell Labs. It was in Fairchild's California building that the next breakthrough occurred—although, somewhat curiously, it also happened at exactly the same time in the Dallas laboratories of Texas Instruments. In Dallas, a young engineer from Kansas named Jack Kilby (1923–2005) was considering how to improve the transistor. Although transistors were a great advance on vacuum tubes, one key problem remained. Machines that used thousands of transistors still had to be hand wired to connect all these components together. That process was laborious, costly, and error prone. Wouldn't it be better, Kilby reflected, if many transistors could be made in a single package? This prompted him to invent the "monolithic" integrated circuit (IC), a collection of transistors and other components that could be manufactured all at once, in a block, on the surface of a semiconductor. Kilby's invention was another step forward, but it also had a drawback: the components in his integrated circuit still had to be connected by hand. While Kilby was making his breakthrough in Dallas, unknown to him, Robert Noyce was perfecting almost exactly the same idea at Fairchild in California. Noyce went one better, however: he found a way to include the connections between components in an integrated circuit, thus automating the entire process. 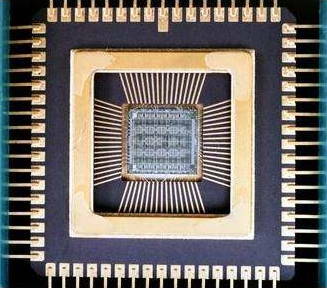 Photo: An integrated circuit seen from the inside. Photo by courtesy of NASA Glenn Research Center (NASA-GRC). Integrated circuits, as much as transistors, helped to shrink computers during the 1960s. In 1943, IBM boss Thomas Watson had reputedly quipped: "I think there is a world market for about five computers." Just two decades later, the company and its competitors had installed around 25,000 large computer systems across the United States. As the 1960s wore on, integrated circuits became increasingly sophisticated and compact. Soon, engineers were speaking of large-scale integration (LSI), in which hundreds of components could be crammed onto a single chip, and then very large-scale integrated (VLSI), when the same chip could contain thousands of components. The logical conclusion of all this miniaturization was that, someday, someone would be able to squeeze an entire computer onto a chip. In 1968, Robert Noyce and Gordon Moore had left Fairchild to establish a new company of their own. With integration very much in their minds, they called it Integrated Electronics or Intel for short. Originally they had planned to make memory chips, but when the company landed an order to make chips for a range of pocket calculators, history headed in a different direction. A couple of their engineers, Federico Faggin (1941–) and Marcian Edward (Ted) Hoff (1937–), realized that instead of making a range of specialist chips for a range of calculators, they could make a universal chip that could be programmed to work in them all. Thus was born the general-purpose, single chip computer or microprocessor—and that brought about the next phase of the computer revolution. By 1974, Intel had launched a popular microprocessor known as the 8080 and computer hobbyists were soon building home computers around it. The first was the MITS Altair 8800, built by Ed Roberts. With its front panel covered in red LED lights and toggle switches, it was a far cry from modern PCs and laptops. Even so, it sold by the thousand and earned Roberts a fortune. The Altair inspired a Californian electronics wizard name Steve Wozniak (1950–) to develop a computer of his own. "Woz" is often described as the hacker's "hacker"—a technically brilliant and highly creative engineer who pushed the boundaries of computing largely for his own amusement. In the mid-1970s, he was working at the Hewlett-Packard computer company in California, and spending his free time tinkering away as a member of the Homebrew Computer Club in the Bay Area. Photos: Microcomputers—the first PCs. The Apple ][ and The Sinclair ZX81, a build-it-yourself microcomputer that became hugely popular in the UK when it was launched in 1981. Both of these machines live in glass cases at Think Tank, the science museum in Birmingham, England. Apple's success selling to businesses came as a great shock to IBM and the other big companies that dominated the computer industry. It didn't take a VisiCalc spreadsheet to figure out that, if the trend continued, upstarts like Apple would undermine IBM's immensely lucrative business market selling "Big Blue" computers. In 1980, IBM finally realized it had to do something and launched a highly streamlined project to save its business. 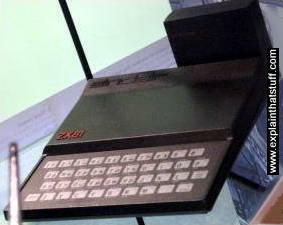 One year later, it released the IBM Personal Computer (PC), based on an Intel 8080 microprocessor, which rapidly reversed the company's fortunes and stole the market back from Apple. The PC was successful essentially for one reason. All the dozens of microcomputers that had been launched in the 1970s—including the Apple ][—were incompatible. All used different hardware and worked in different ways. Most were programmed using a simple, English-like language called BASIC, but each one used its own flavor of BASIC, which was tied closely to the machine's hardware design. As a result, programs written for one machine would generally not run on another one without a great deal of conversion. Companies who wrote software professionally typically wrote it just for one machine and, consequently, there was no software industry to speak of. In 1976, Gary Kildall (1942–1994), a teacher and computer scientist, and one of the founders of the Homebrew Computer Club, had figured out a solution to this problem. Kildall wrote an operating system (a computer's fundamental control software) called CP/M that acted as an intermediary between the user's programs and the machine's hardware. With a stroke of genius, Kildall realized that all he had to do was rewrite CP/M so it worked on each different machine. Then all those machines could run identical user programs—without any modification at all—inside CP/M. That would make all the different microcomputers compatible at a stroke. By the early 1980s, Kildall had become a multimillionaire through the success of his invention: the first personal computer operating system. Naturally, when IBM was developing its personal computer, it approached him hoping to put CP/M on its own machine. Legend has it that Kildall was out flying his personal plane when IBM called, so missed out on one of the world's greatest deals. But the truth seems to have been that IBM wanted to buy CP/M outright for just $200,000, while Kildall recognized his product was worth millions more and refused to sell. Instead, IBM turned to a young programmer named Bill Gates (1955–). His then tiny company, Microsoft, rapidly put together an operating system called DOS, based on a product called QDOS (Quick and Dirty Operating System), which they acquired from Seattle Computer Products. Some believe Microsoft and IBM cheated Kildall out of his place in computer history; Kildall himself accused them of copying his ideas. Others think Gates was simply the shrewder businessman. Either way, the IBM PC, powered by Microsoft's operating system, was a runaway success. 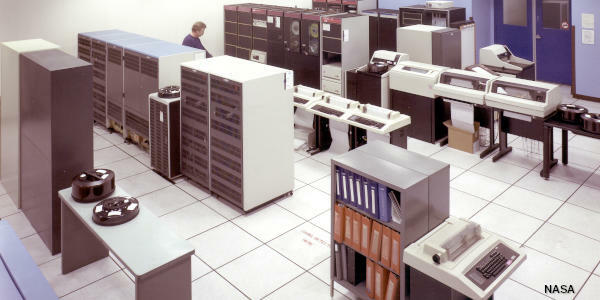 Photo: Personal computers threatened companies making large "mainframes" like this one. Picture courtesy of NASA on the Commons (where you can download a larger version). Fortunately for Apple, it had another great idea. One of the Apple II's strongest suits was its sheer "user-friendliness." For Steve Jobs, developing truly easy-to-use computers became a personal mission in the early 1980s. What truly inspired him was a visit to PARC (Palo Alto Research Center), a cutting-edge computer laboratory then run as a division of the Xerox Corporation. Xerox had started developing computers in the early 1970s, believing they would make paper (and the highly lucrative photocopiers Xerox made) obsolete. One of PARC's research projects was an advanced $40,000 computer called the Xerox Alto. Unlike most microcomputers launched in the 1970s, which were programmed by typing in text commands, the Alto had a desktop-like screen with little picture icons that could be moved around with a mouse: it was the very first graphical user interface (GUI, pronounced "gooey")—an idea conceived by Alan Kay (1940–) and now used in virtually every modern computer. The Alto borrowed some of its ideas, including the mouse, from 1960s computer pioneer Douglas Engelbart (1925–2013). Back at Apple, Jobs launched his own version of the Alto project to develop an easy-to-use computer called PITS (Person In The Street). This machine became the Apple Lisa, launched in January 1983—the first widely available computer with a GUI desktop. With a retail price of $10,000, over three times the cost of an IBM PC, the Lisa was a commercial flop. But it paved the way for a better, cheaper machine called the Macintosh that Jobs unveiled a year later, in January 1984. With its memorable launch ad for the Macintosh inspired by George Orwell's novel 1984, and directed by Ridley Scott (director of the dystopic movie Blade Runner), Apple took a swipe at IBM's monopoly, criticizing what it portrayed as the firm's domineering—even totalitarian—approach: Big Blue was really Big Brother. Apple's ad promised a very different vision: "On January 24, Apple Computer will introduce Macintosh. And you'll see why 1984 won't be like '1984'." The Macintosh was a critical success and helped to invent the new field of desktop publishing in the mid-1980s, yet it never came close to challenging IBM's position. 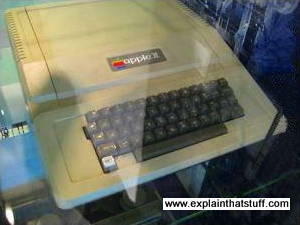 Ironically, Jobs' easy-to-use machine also helped Microsoft to dislodge IBM as the world's leading force in computing. When Bill Gates saw how the Macintosh worked, with its easy-to-use picture-icon desktop, he launched Windows, an upgraded version of his MS-DOS software. Apple saw this as blatant plagiarism and filed a $5.5 billion copyright lawsuit in 1988. Four years later, the case collapsed with Microsoft effectively securing the right to use the Macintosh "look and feel" in all present and future versions of Windows. Microsoft's Windows 95 system, launched three years later, had an easy-to-use, Macintosh-like desktop and MS-DOS running behind the scenes. 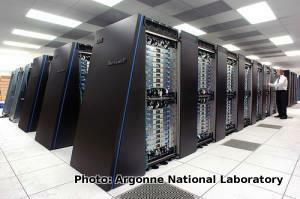 Photo: The IBM Blue Gene/P supercomputer at Argonne National Laboratory: one of the world's most powerful computers. Picture courtesy of Argonne National Laboratory published on Flickr in 2009 under a Creative Commons Licence. Standardized PCs running standardized software brought a big benefit for businesses: computers could be linked together into networks to share information. At Xerox PARC in 1973, electrical engineer Bob Metcalfe (1946–) developed a new way of linking computers "through the ether" (empty space) that he called Ethernet. A few years later, Metcalfe left Xerox to form his own company, 3Com, to help companies realize "Metcalfe's Law": computers become useful the more closely connected they are to other people's computers. As more and more companies explored the power of local area networks (LANs), so, as the 1980s progressed, it became clear that there were great benefits to be gained by connecting computers over even greater distances—into so-called wide area networks (WANs). Photo: Computers aren't what they used to be: they're much less noticeable because they're much more seamlessly integrated into everyday life. 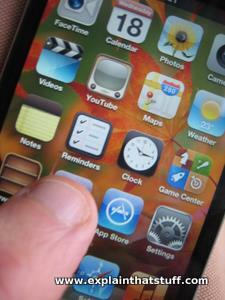 Some are "embedded" into household gadgets like coffee makers or televisions. Others travel round in our pockets in our smartphones—essentially pocket computers that we can program simply by downloading "apps" (applications). Today, the best known WAN is the Internet—a global network of individual computers and LANs that links up hundreds of millions of people. The history of the Internet is another story, but it began in the 1960s when four American universities launched a project to connect their computer systems together to make the first WAN. Later, with funding for the Department of Defense, that network became a bigger project called ARPANET (Advanced Research Projects Agency Network). In the mid-1980s, the US National Science Foundation (NSF) launched its own WAN called NSFNET. The convergence of all these networks produced what we now call the Internet later in the 1980s. Shortly afterward, the power of networking gave British computer programmer Tim Berners-Lee (1955–) his big idea: to combine the power of computer networks with the information-sharing idea Vannevar Bush had proposed in 1945. Thus, was born the World Wide Web—an easy way of sharing information over a computer network, which made possible the modern age of cloud computing (where anyone can access vast computing power over the Internet without having to worry about where or how their data is processed). It's Tim Berners-Lee's invention that brings you this potted history of computing today! How computers work: A basic guide. Cloud computing: How the Internet can provide access to vast, distributed computing power. Buying a new computer: Laptop or desktop? New or secondhand? Windows, Max, or Linux? We list the most important considerations for computer buyers. Quantum computing: Will atomic-scale computers overcome the limitations of today's machines? Supercomputers: How do the world's most powerful computers work? Computing articles: A list of all the computer-related articles on this site. There are lots of websites covering computer history. Here are a just a few favorites worth exploring! The Computer History Museum: The website of the world's biggest computer museum in California. The Computing Age: A BBC special report into computing past, present, and future. IBM History: Many fascinating online exhibits, as well as inside information about the part IBM inventors have played in wider computer history. Wikipedia History of Computing Hardware: covers similar ground to this page. Computer history images: A small but interesting selection of photos. Transistorized! 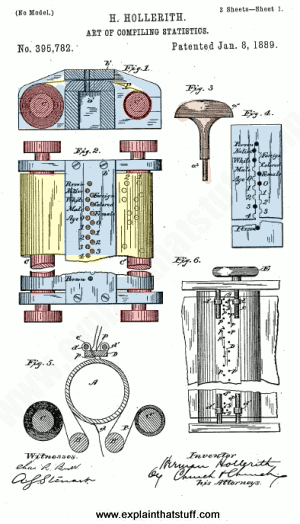 : The history of the invention of the transistor from PBS. Intel Museum: The story of Intel's contributions to computing from the 1970s onward. The Difference Engine: A great introduction to Babbage's Difference Engine from Doron Swade, one of the world's leading Babbage experts. The ENIAC: A short Movietone news clip about the completion of the world's first programmable electronic computer. A tour of the Computer History Museum: Dag Spicer gives us a tour of the world's most famous computer museum, in California. Berners-Lee, Tim with Mark Fischetti. Weaving the Web: The Original Design and Ultimate Destiny of the World Wide Web by its Inventor. San Fransisco, California: HarperCollins, 1999. Tim Berners-Lee tells his own story of what he hopes to achieve with the World Wide Web. Cringely, Robert. Accidental Empires : How the Boys of Silicon Valley Make Their Millions, Battle Foreign Competition, and Still Can't Get a Date. New York: HarperBusiness, 1996. The story of personal computing in the 1980s. Hodges, Andrew. Alan Turing: The Enigma. New York: Random House, 1992. Sets out Turing's fundamental contributions to the theory of computers and artificial intelligence and his pivotal importance as a wartime codebreaker, as well as telling his fascinating and tragic personal story. Lean, Tom. Electronic Dreams. London: Bloomsbury Sigma, 2016. A fascinating and very readable history of the PC, told from a British perspective, and with an emphasis on British computer developers such as Sinclair, Acorn, and the BBC. Levy, Steven. Hackers: Heroes of the Computer Revolution. New York: Penguin, 2010. The stories of creative computer pioneers such as Steve Wozniak. Moschovitis, Christos, Hilary Poole, Laura Lambert, and Chris Woodford. The Internet: A Historical Encyclopedia. Santa Barbara, California: ABC-Clio: 2005. A definitive three-volume history of the Internet, including a chronology, a book of biographies, and a look at the key issues challenging the Internet's development. Ask your library to order it if you can't find it. Riordan, Michael and Lillian Hoddeson. Crystal Fire: The Invention of the Transistor and the Birth of the Information Age. New York: W. W. Norton & Co., 1998. How John Bardeen, Walter Brattain, and William Shockley invented the transistor—and how Robert Noyce and Jack Kilby developed it thereafter. Rojas, Rául (ed). Encyclopedia of Computers and Computer History. Chicago: Fitzroy Dearborn, 2001. A definitive two-volume history. Ask your library to order it if you can't find it. Swade, Doron. The Difference Engine: Charles Babbage and the Quest to Build the First Computer. New York: Viking, 2001. How Babbage tried to build the first mechanical computer. Gifford, Clive. The Science of Computers. London: Hachette, 2016. A solid, basic, 32-page introduction for ages 8–10. Oxlade, Chris. The History of Computers. London: Raintree, 2018. This book covers roughly the same sequence of events as my article, but in simplified, 32-page form for ages 8–10. Woodford, Chris. Communication and Computers. New York: Facts on File, 2004. One of my own books, this puts the history of computers into a broader context, as part of the story of human communication technology. This is suitable for ages 10+. ↑ There is a charming tribute to Boole in Popular Science, October 1880, p.840. ↑ Babbage scholars tend to bristle at hagiography of Lovelace. For example, Doron Swade, who led the project to reconstruct Babbage's engines at the London Science Museum, writes: "The notion that [Lovelace] made inspirational contribution to the development of the Engines is not supported by the known chronology of events... Posthumous eulogies of this kind, well intentioned as they are, have mythologised both her mathematical abilities and her role in the development of the Engines..." See The Cogwheel Brain, Chapter 8. ↑ As We May Think by Vannevar Bush, The Atlantic, July 1945. ↑ The "father of radio" is about as accurate and useful a description as "the inventor of the computer": it could equally well be applied to Maxwell, Hertz, Lodge, Marconi, and (some claim) Tesla. ↑ Outside the computing world, von Neumann's contributions—summarized in the glib phrase "the stored program technique"—remain little known and even less understood. For a very quick summary, see John von Neumann at the Centre for Computing History; for much more detail, try John von Neumann and the Origins of Modern Computing by William Aspray, MIT Press, 1990. ↑ You can listen to Maurice Wilkes describing his life in an oral history recording from the British Library made by Tom Lean in 2010. ↑ The best account of this story is Crystal Fire: The Invention of the Transistor and the Birth of the Information Age by Michael Riordan and Lillian Hoddeson. ↑ Steven Levy tells the early Apple story very well, positioning it in the wider context of computer history in Hackers: Heroes of the Computer Revolution. ↑ For a riveting account of the early PC years, it's hard to beat Accidental Empires : How the Boys of Silicon Valley Make Their Millions, Battle Foreign Competition, and Still Can't Get a Date by Robert X. Cringely. Tom Lean narrates the British side of the same story (Sinclair, Acorn, BBC Micro, and so on) very well in his book Electronic Dreams.